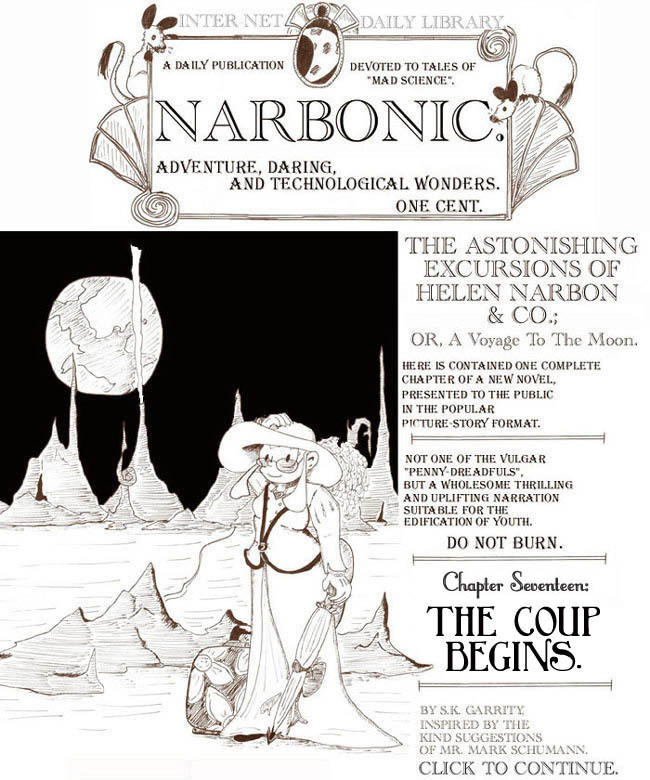 The Astonishing Excursions of Helen Narbon &Co., Chapter Seventeen. I was really plotting by the seat of my pants at this point. The entire Victorian storyline was mostly made up as I went along, but around here I had absolutely no idea where it was going. Once I got everyone to Mars, things started to fall together again. Yes, it’s very silly that words that begin with “A” in our language would also begin with “A” in the Venusian language. Sometimes this is not a very logical comic. The Venusian writing on the wall in the first panel reads, “Keep Out.” The “no fish” symbol carries the same meaning. BECAUSE THEY ARE FISH. Hammerhead shark guys are pretty cool. I had the rest of the chapter drawn, but I was getting married on Saturday, so I figured I’d split the chapter in two and give myself a weekend off. I was having a lot of trouble sticking to my daily schedule around this time, which was why Andrew had to step in with a guest week. Wedding stuff is ridiculously time-consuming. Speaking of romantic stuff, check out this pinup of Helen and Dave by Sarah. Thanks so much, Sarah! Sarah adds, “Sorry if I made Dave too hot.” Please. Dave is always hot. Meanwhile, Caliban gets a cameo in today’s installment of Ed Gedeon’s Everyday Heroes. Man, I miss drawing Caliban, even though he’s my most generic character design. I miss his snippy little attitude. “KEEP OUT” maybe? It looks like there’s a K rotated about 25 degrees clockwise. 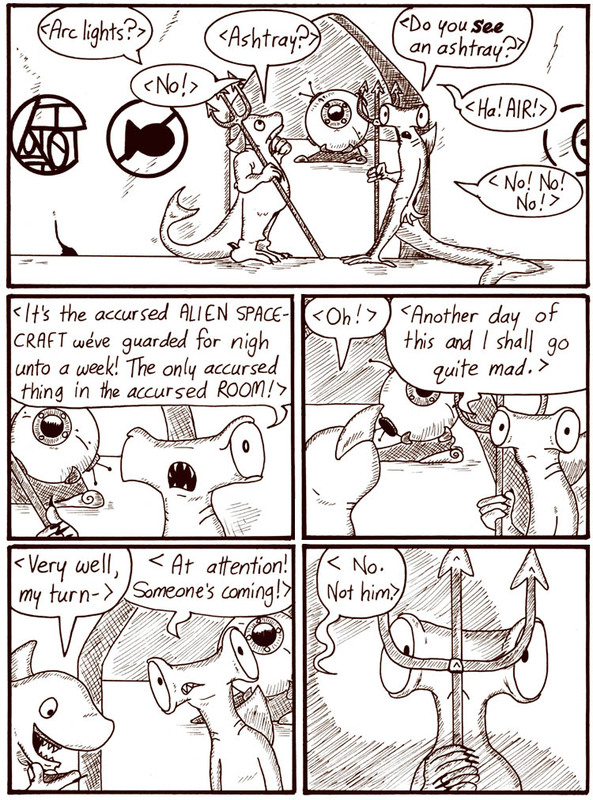 My favorite is panel 3, with the hammerhead guard’s blank expression and “Another day of this and I shall go quite mad.” Poor guy, I’ve had jobs like that.